Negotiate with your fellow Petroleum and Natural Gas Exporters Association (PANGEA) members to determine how much natural gas to sell each year relative to global demand, affecting global prices and—by extension—your payout. Cooperation benefits all, but selfish moves can put lots of Gas and money in your hands. You will agree to a plan, but it is non-binding, as final sales are chosen in private. Do you choose to work with your fellow cartel members and succeed together or defect for your personal interest? And how will that decision affect negotiations in future years? The PANGEA member with the most money when all the gas is out of the ground wins! Pick your favorite (?) fossil fuels company to play! Challenge your friends to a Prisoner’s Dilemma! Note: This game was created as part of a class that required a 15-20 minute play time. 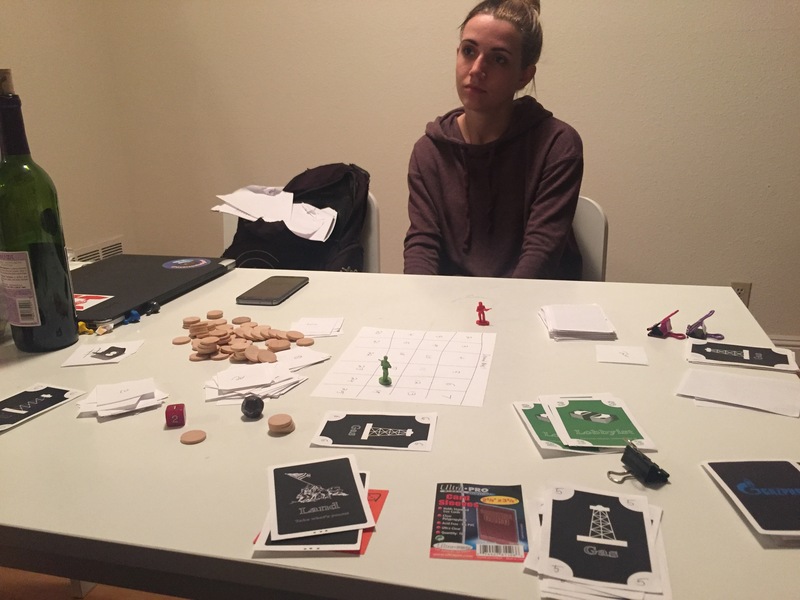 My initial goal was to create a game that had the strategic fun of something like Monopoly but didn’t leave families hating each other afterwards. 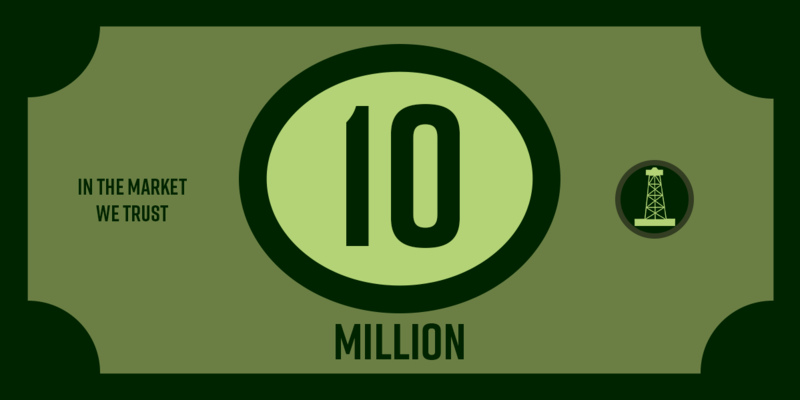 Arbitrary number derived from the fact that six cards fit well on a page…. This card was designed to introduce some surprises, and the two different levels to introduce some randomness, both of which would soften the feel of the game. Wanted to add uncertainty and fear of this card as well as the ability to meddle. Give each player a space to start and resources (in the fiction). Give a sense of accomplishment as players take over land. Seemed to be a good narrative proxy for first to a monopoly. Opposition: Others selling too much, deals that alter your plans, as well as the repercussions of your own decisions. End: Player with the most money when all the Gas is out of the ground wins! Note: Nothing in this list is the same (or at least not in the same quantity) as the original. 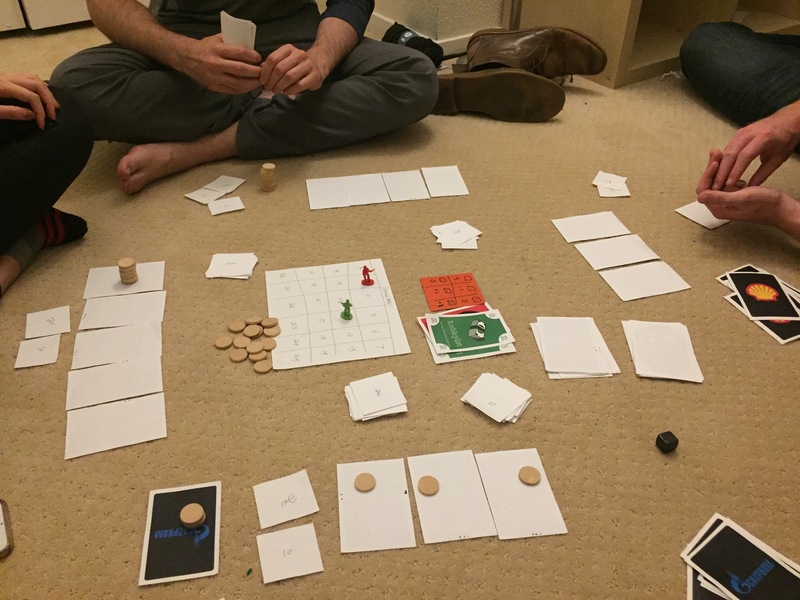 I got everything I needed to get out of my first playtest in about 7 minutes: I learned that the core of my game was a quarter of a page of my five-page rule set and that that quarter-page was way off-balance. If you sell exactly at Global Demand: Everyone gets one extra card. If you sell more than Global Demand: The Player who sold the most Gas gets to Draw from the Turn Deck first, then second most, then third until all demand is diminished. In case of a tie, the person to the left of the roller goes first. If you sell below Global Demand: Everyone gets 2 extra cards. The result: a race to the top. In my attempt to provide a tempting reward for defecting, I took away any disincentive. 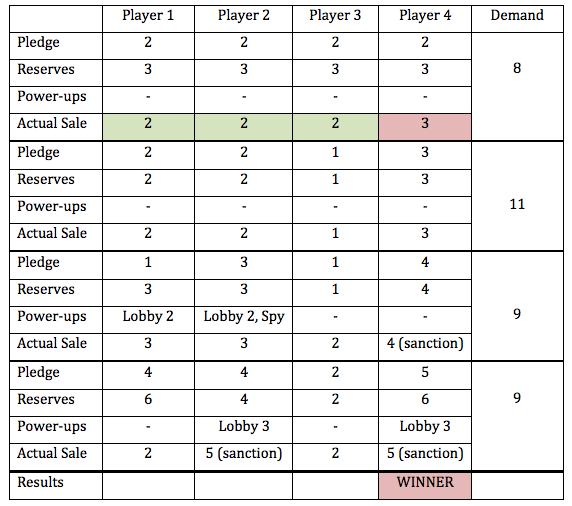 I simplified the four-state, two-player Prisoner’s Dilemma into three states, and of those three states, two represent different versions of cooperation, while one represents all three setups related to defection. I would argue that deviation is appropriate in this multiplayer setup—n-Player Prisoner’s Dilemma (NPD)—wherein there are multitudinous gradations of defection instead of the classic setup’s three. My problem was not in the simplification into three states but in that I did not allow for those gradations; I had removed any types of collective failure and instead pitted individual success against individual failure, meaning everyone would try to succeed. It became clear in the first turn that everyone would sell the maximum amount of oil and then that those players who didn’t get land would be effectively out of the game. I tried a quick change to flip to incentivizing the lowest sale, and then everyone instead undersold. These rules made the optimal strategy too obvious, so at this point, I suspended the game and went back to rewrite that quarter-page. Eliminated because of added complexity and play time. This was softened with penalties for the biggest liars, so now the opposition can also be your own bad decisions. If you sell more than Global Demand: Players get 1 land for every 2 Gas sold, rounding down. The Player who sold the most gets Sanctioned, meaning they get no land for this turn. If there is more than one player who sold the most, the Sanction goes to the player closest to the roller’s left. If you sell at or below Global Demand: Players get 1 land for every 1 Gas sold. The Player who sold the most also gets any that remain in the Global Demand pile. If there is more that one player who sold the most, the cards go to the player closest to the roller’s left. Have the win state at 10 land, or perhaps even less. Play the negotiation phase with declared car face up. Limit to two rounds of discussion. The Spy had a tough time deciding to screw others over (likely, he thought, me) or not because he’d have to screw himself over, too. He decided not to screw himself over. Gotta love that self-interest. All the hesitation at committing. 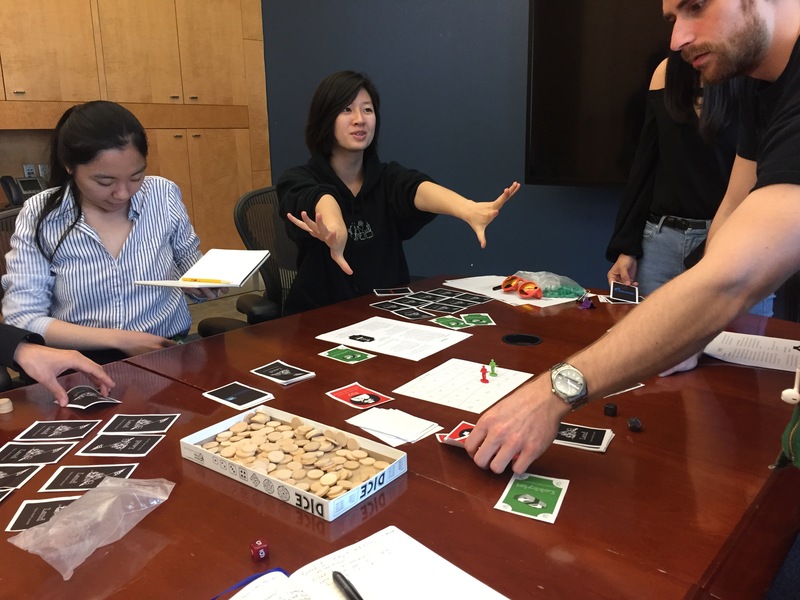 Putting down lobbyist cards—this moment meant that the player may have a chance for an unexpectedly great turn. Spy cards weren’t as strong as I had thought. This is actually good, as I worried they were too powerful. This is because our team was normally pretty close to or in a defect state, so there wasn’t necessarily much to do. Gas reserves stopped mattering later in the game because everyone had a ton of land producing gas. There was an incentive to hide Land cards later in the game. The board was too abstract. There was no real reason for those who played Lobbyist cards to switch Gas cards. 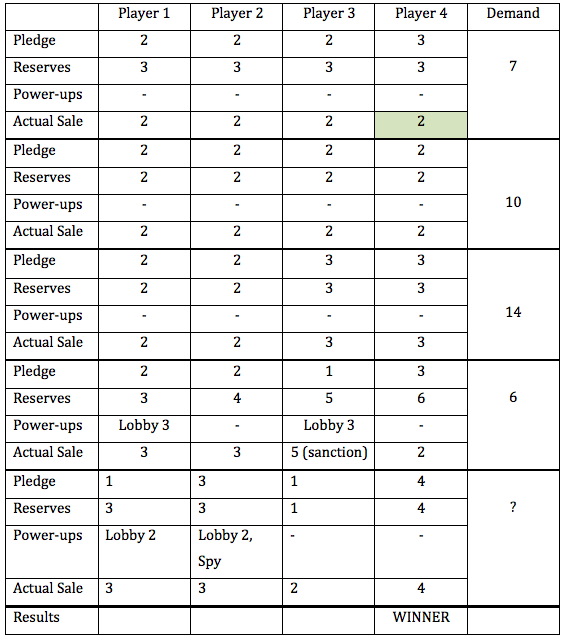 Players wanted a way to show what pledges were during negotiations. Added one die because the average demand was too low. Simplified rules so that anyone who sells the most when exceeding demand now gets no payout, making penalties more fair and clear. Limited discussion to two rounds, so decisions need to be made with less deliberation. This is to shorten the game. This play through ended with no one able to win as, with the introduction of one-time-use Gas Cards for pledges, no one had any cards left after 6 rounds. By this point, I thought the game had stabilized to approximately a five-round game, but this one became six because of some interesting Spy behavior: they changed their card to screw over the rest of the world intentionally while also sacrificing themselves to do so. That card adds a lot of interesting decisions to the game, which make it one of my favorites. Overall, however, the one-time-use cards were a bad call, so I thusly eliminated that rule. These were the first games that actually came close to the 15-20 minute range, which was exciting. Of note, the first cheater here was the winner, which seems too easy. In looking at my data, it seems I must have forgotten to enforce the sanction rule, which exacerbated this problem. You’ll also note that people often tried to sell more than they had, which was partially derived from there being too many numbers and meters in the game and partially from a misunderstanding of the rules. You’ll note here that Player 4 decided that honesty was a good policy in the second go-around, likely because I actually enforced the sanction rule, though I assume that may have begun after the first turn, as technically all should have been sanctioned that turn. Player 4 did win again, though that had a lot to do with turn order. Overall, math and numbers were a big problem here, leading me to think of a way to replace the Gas Meter (Reserves). Also, a dynamic of hating Lobbyist cards at first and loving them later in the game clearly emerged, as they were only useful when a lot of gas was on the table. My thought was that I should perhaps lower the amount. Overall, these games were a lot of fun. Progress! 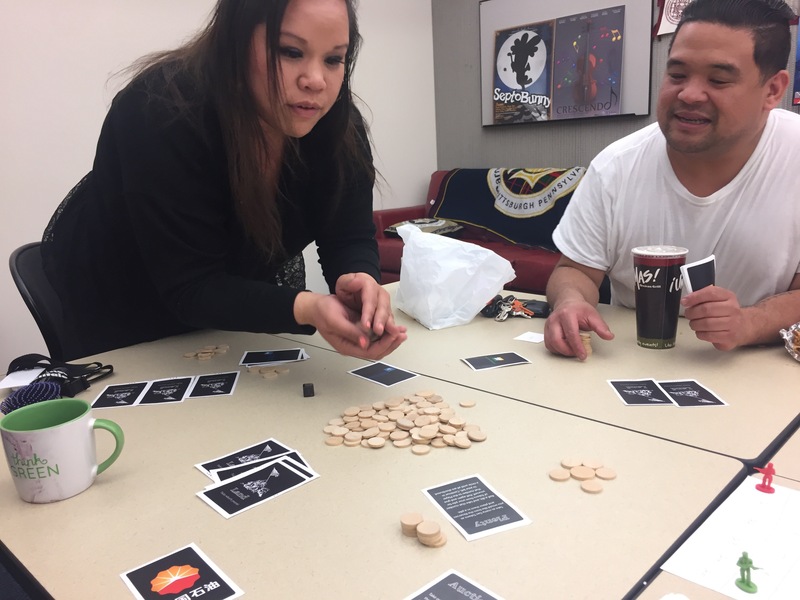 Also, of note, my semester goal was to make a lying and cheating game that was soft enough that my family would enjoy it. 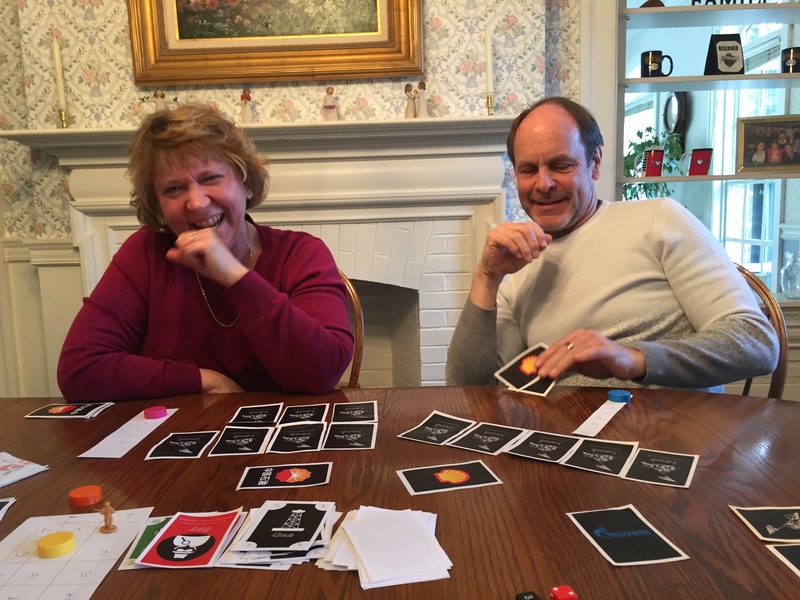 This test was with my family… and they really seemed to enjoy it! Hooray! I never counted these, just grabbed a bag. 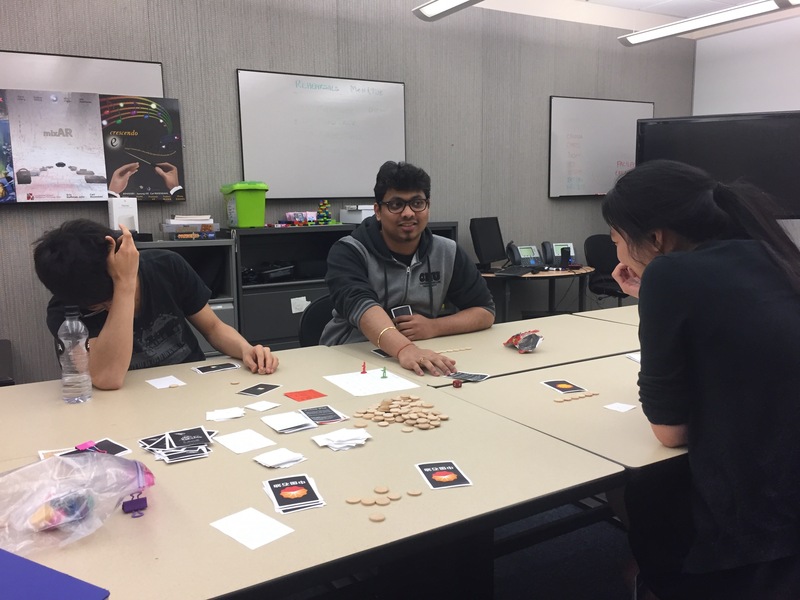 This was the in-class playtest during which I couldn’t say anything about the rules, so I learned a lot about some confusion players had about the relationships between different quantities in the game. Overall, despite some questions, they did play the game correctly. However, it wasn’t tremendously engaging until players got into the swing of the game closer to the end. This had a lot to do with global demand being too high at the beginning, which was a random occurrence, but an occurrence it would be good to eliminate. At this point, the game was pretty consistently within the correct timeframe, but there weren’t many interesting strategy choices. For instance, one player just lied the whole time, and he ended up winning. That broke the spirit of the game, making it less engaging for all. Plenty: Take as much Gas as you want but distribute it to others as well. Brought back to 6 of each because the game needed more of the moments that Lobbyists introduce. Changed to one custom D6 with values of -3, -1, 0, 0, +1, and +3. Demand now always starts at 3 x the number of players. This was to both create a tutorial level and to decrease randomness. Changed to player with the most money when the land runs out winning. I made this change because earning money made much more sense in the fiction, and land running out seemed like a fun moment in the fiction. 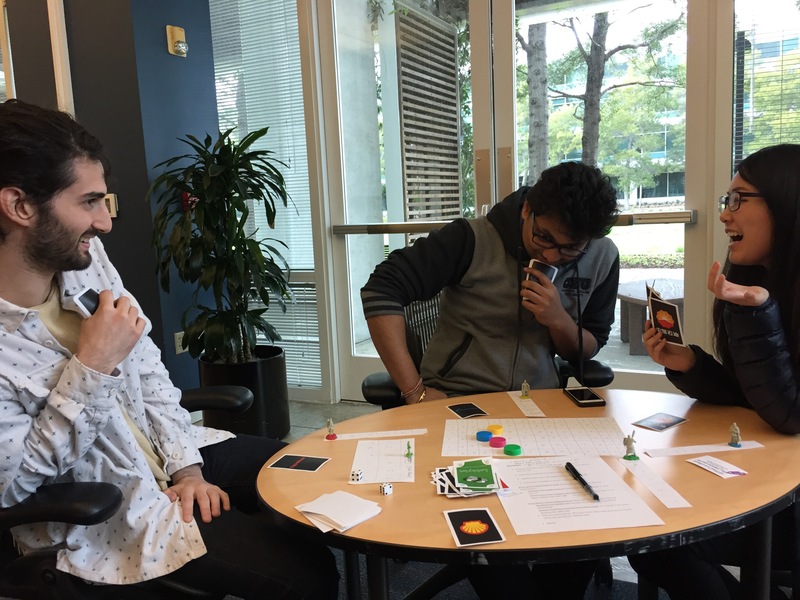 This was a really fun but also totally wacky playtest. 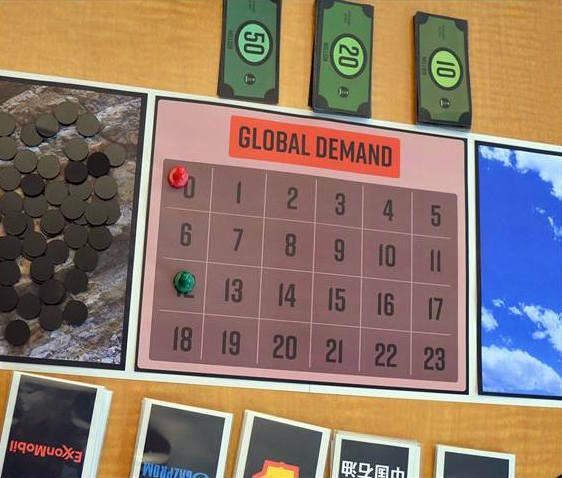 The game never ended within a 40-minute period because of the Plenty card: one player took all of the Gas Reserves and distributed them, meaning no one needed to buy land. I had assumed people would be more selfish, but I was wrong. Sionara, Plenty. Interestingly, a very strong dynamic between the Spy and Price Fix emerged, as anyone who had a Spy could check on the deal before it closed. However, it provided no opportunity to get out of a bad deal, just to get vengeance. A playability issue that popped up was having to reset Global Demand after a Lobbyist card was played. This felt a bit cumbersome, but it seemed necessary at the time, as I didn’t want demand to get too high since it makes the game more dull. Eliminated because it has the potential to break the game. This game also did not end, and it was one of my lowest-energy games (which may have had something to do with the fact that it was played around 11 PM). I learned that the Auction card was less interesting than I had thought, as players would only rationally pay 1 or 2 Gas for it because those cards weren’t a scarce resource. Invest was dismissed as an undesirable option by players, and it really only seemed like a great card to play at the very end of the game. As for Price Fix, it was unclear to my players how to use it strategically. 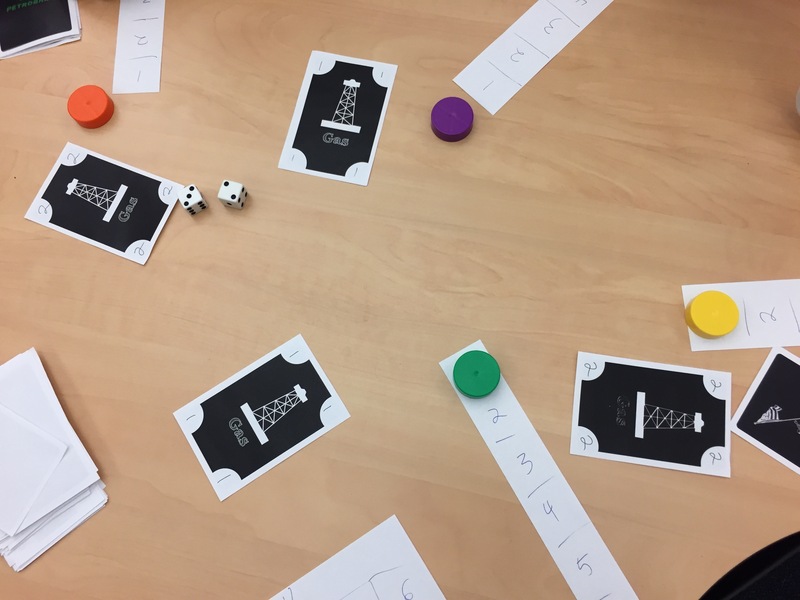 As for other game elements, we considered the option of adding a freebie card each round to keep the game moving, as it stalled due to a glut of gas for some and getting the bad end of a deal for others. Finally, on that note, it was very difficult to recover from a bad deal. Eliminated because it was uninteresting. Eliminated because it was unappealing. 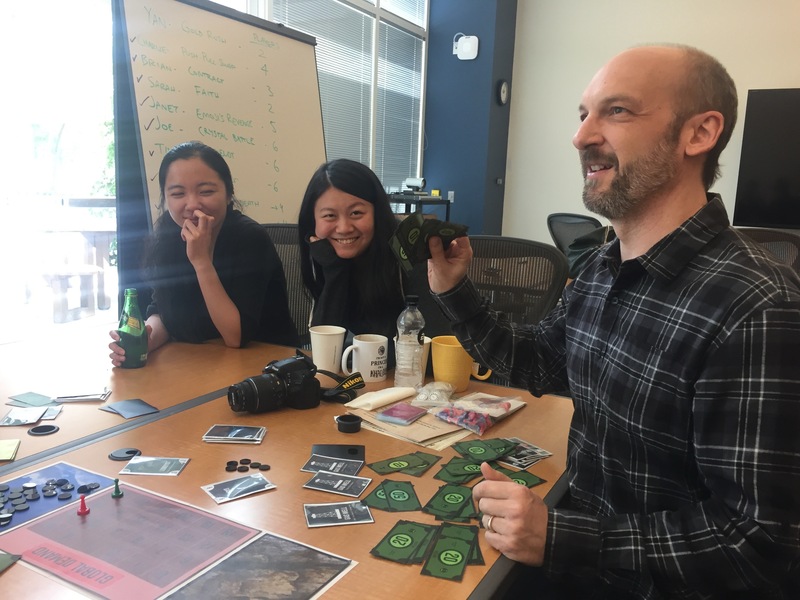 This was the third playtest in a row that didn’t have an ending. Uh oh. This test had similar problems, as it was difficult to recover from bad decisions. However, I had a very enlightening conversation with playtesters that identified some of my key problems. First, it was difficult to play a game in which players need to spend victory points, as it was hard to make progress since the end condition was tied to depleting land which required spending those victory points (money). Furthermore, the interest curve of the game was not building—the end would have been a fizzle. Finally, more tactically, while Price Fixing was a lot of fun, it was really confusing to have multi-way deals. I’d love to implement that in future versions beyond the class, but for now, deals will only be between two people. Partly because it was windy (this was an outdoor test), but also because I didn’t really think it was necessary. Also, players each get one free Land per turn. End: Most land when land runs out wins. Changed from money because of complications with spending victory points and because money was eliminated. 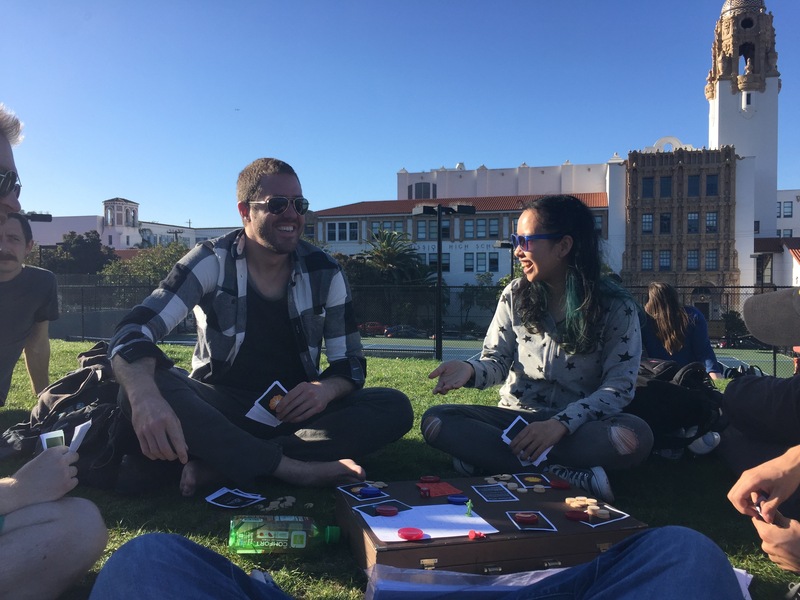 This playtest too place immediately after a drive to Dolores Park from the previous playtest, so I didn’t have much of a chance to actually implement the changes I wanted. Also, as previously mentioned, the fact that this was outside changed a few things, namely the elimination of money, but it provided a really interesting opportunity to learn about the role money had previously played in the game. I learned that, as it was, its most important role was to allow strategic choices as to whether to purchase land or Price Fixes. And then, of course, it provided a victory condition grounded in the fiction. This game was a mess, but it was actually really fun! Players felt very powerful as power-ups were forced into their hands and as the Gas and land piled up. Strategy moments did emerge with the Spy and with the Price Fix (and with the two together), but the strategy of choosing to purchase those cards was missing, and the game became a bit too casual given the glut of Gas. During the debrief, I again heard complaints about the Price Fix card providing no escape for someone using a Spy card, as the only option was to screw over the cheater, not to help yourself. This needed fixing. It’s back, both as a victory condition and a way to make strategic choices. Reduced the number to help the interest curve along. I wanted to get out of the Land-purchasing phase quickly and to get to a point where the game became all about selling and getting the most money for each unity of Gas. Now, Spy and Lobbyist cards were put in the same deck as Price Fix, meaning there is a Land and a Strategy deck. Shifted from 4 to 2 because of the Spy’s power. This helped drive overall card reductions, as I wanted to reduce the number of Spy moments—they were fun but too many made the game boring because they were so powerful—but still wanted to guarantee their presence in the game. Thus, this affected the proportions of other cards. Reduced from 6 to fit the rebalancing need derived from the Spy. I wanted Lobbyist cards to be about half the deck, as they provided good surprises while keeping the game moving. Reduced from 12 to fit the rebalancing need derived from the Spy. Wanted this number to be higher than the Spy card number so that some Price Fixes could happen without either party knowing what would happen. Also, picked this number because I wanted Lobbyists to be emphasized. Changed the terms of double defection to half payout so that players who did play a Spy had a chance to save themselves. Tied back to money now that Land acquisition was de-emphasized as key to the game. This is also not tied to Land depletion anymore. Finally, I could see the light at the end of the tunnel here. The efforts to rework the interest curve definitely paid off. The land running out forced an interesting ending of desperation wherein lots of Lobbyist cards came out, but only after players tried to keep each other in check through price fixing. Some tinkering was needed with the end condition: we changed the cutoff to $100 to stay within the allotted time. Also, demand was abnormally low, which stalled the game a bit—there’s a bit too much randomness still. Lastly, the game does need a bit more Gas, as ¾ of players ran out by the end. This final test felt pretty good except for the continuous lying of the same player who broke the experience in Playtest 6. This time, we introduced a fix mid-game of giving an honesty bonus of one card. This disincentivized lying enough to change his strategy. Land stopped mattering after about 2 turns, which was good, as it allowed the game to pivot towards strategy. This was a result especially of Gas Wells generating Gas continuously. Price Fix cards were fun and powerful, and actually perhaps too powerful, as they propelled three of us to victory concurrently. End: The player who has the most money the turn after Gas runs out wins! This makes a lot more sense in fiction than first to a certain amount of money winning. It also, as it turns out, takes the same amount of turns on average: four. Honesty bonus: Draw any one card if you sell what you pledged. Ordered some more to accommodate 5 players. We got really close to going over 50 but never did. 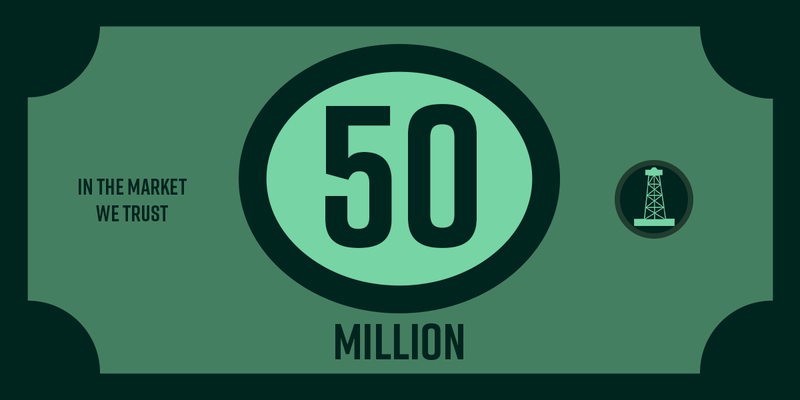 4 Players on average will go through 56 Tokens in 3 turns, while 5 will go through 80, thus these amounts. The game isn’t as fun with three and takes too long with six.